This article was originally published in the Aug. 7, 2016 edition of the Sun. “I had nothing else going on in my life that I was happy about. There are plenty of physical outlets for men in virtually every community. 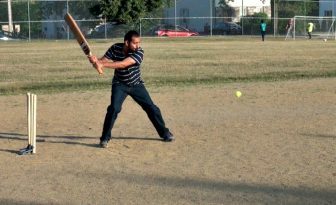 From football to beer-league softball, to rugby or cricket, it’s easy for guys to find a way to let out their frustrations. 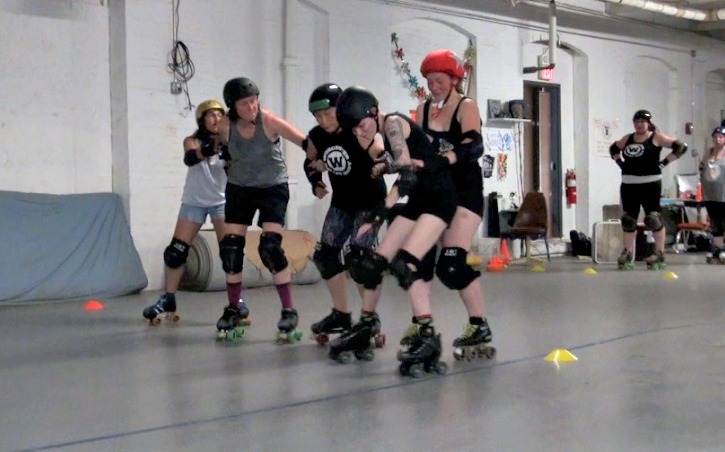 Finding that outlet isn’t as easy for women, especially those craving competition and contact, but since 2011, Worcester Roller Derby (WoRD) has been filling that void — and providing a unique social environment for ladies of all ages and backgrounds. Right now, WoRD is in a period of transition. The league, which aims to field two teams and support a junior program, saw the majority of its experienced players move on recently, and right now, the few experienced skaters are just focused on getting the “fresh meat” ready for contact. Welcome to roller derby, right at home in The Wide Woo of Sports. “Our league is going through a big change right now,” Liz Couture said. “Something like two-thirds of our veteran skaters left, just for life reasons. This is a three-day-a-week commitment, so as soon as a baby, or moving pops up, it’s easy for that to happen. “Usually it’s around two or three people leaving each year, but this time it was, like, everyone, so we’re switching into ‘fresh meat’ mode. We’ve recruited a whole ton of new skaters, and I’ve kind of been running it, even though I don’t feel like I’m that good at it,” Couture added with a laugh. Couture, or T-Flex as she’s known on the rink, has been with WoRD for three years, but she’s now a seasoned pro compared to the majority of the roster, with many of the skaters joining within the last year. 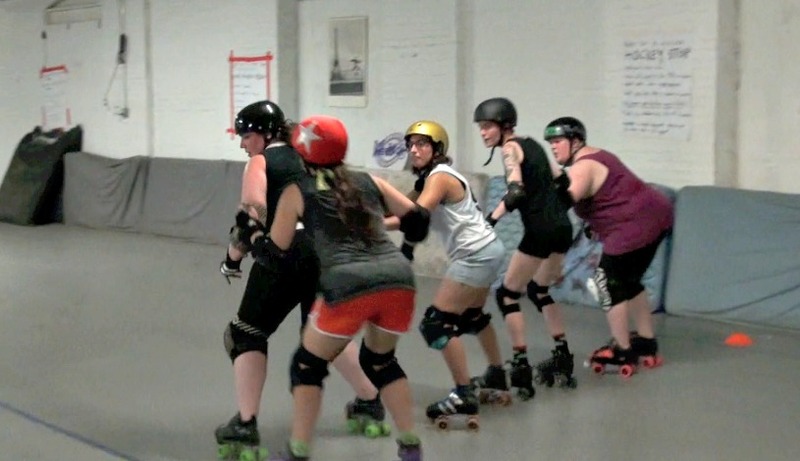 During their practices upstairs in a warehouse on Suffolk Street, these new skaters battle the heat to earn the right to actually hit each other. Pihl, also known as Kat Smashley, was kidding about that last part, but serious about the league not being able to scrimmage yet. On top of just needing bodies, the league needs qualified skaters. 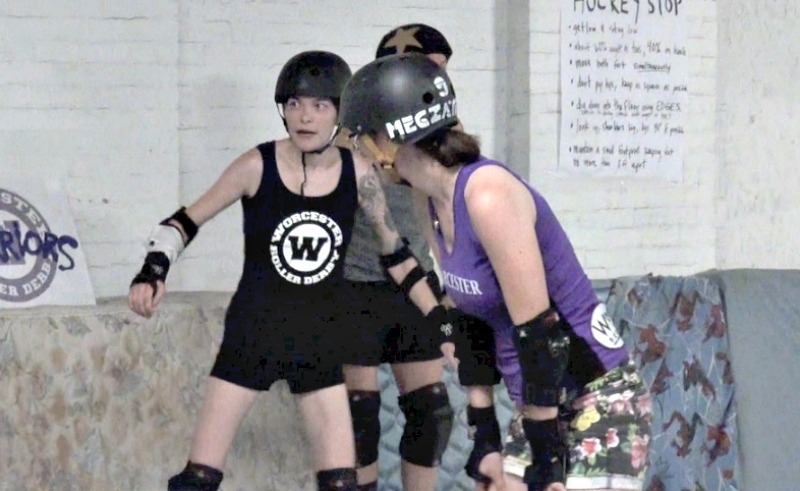 Pihl, who joined WoRD in May to let out some “mommy rage,” and other new skaters must pass different assessments to become practice and scrimmage eligible. Level One means you can hit, but you can’t scrimmage until you pass Level Two assessments, which test a player’s skating and balance more thoroughly. The lack of scrimmage-eligible players was a big reason why WoRD was unable to host its annual “All 8 on the Floor” tournament, but the organization will make up for it by hosting “WooPS!”, a series of three to four mixed scrimmages, combining skaters of all ages and levels, from 2 to 8 p.m. on Saturday, Aug 13. That event will take place at Horgan Arena in Auburn, WoRD’s home rink, and will offer many of the skaters a first taste of live roller-derby. For other skaters, it will be a return to the rink after some time away. Cara Berg Powers, who runs the UMass Boston-based nonprofit Press Pass TV, which introduces Boston youth to all kinds of media, will be making her return after several months off. The day Berg Powers was cleared for contact last year, she tore her meniscus, but she never questioned that she’d be back. “It’s been an awesome place for me to have my ‘me time,’ but also, I run an organization, I’m on a bunch of boards [including the Worcester Human Rights Commission], I’m very engaged in the community. … This is a place where I’m not thinking about anything. I’m just here, I’m focused,” Berg Powers said. Kat Pihl, left, and Meg O’Rourke, better known as Kat Smashley and Megzatron. Liz Cunningham, also known as Betty Battle Axe, was a member of the first “fresh meat” class in 2012. “When I first came out, I didn’t belong to a gym or anything, so I just needed exercise,” Cunningham said. “It was a good way to do something regularly, because you start and you want to get better. The dynamic has changed a lot over the years; now it’s more about community than it is aggression, because we’re doing a lot more team-building stuff than we are beating the crap out of each other. Team building is essential right now, and the community the league provides is perhaps even more of a selling point than the physical act of bashing people on skates. Through the team, Couture met her fiancee Meg O’Rourke, also known as Megzatron at the derby. The two actually attended Clark University together, but didn’t become close until joining WoRD after graduation. 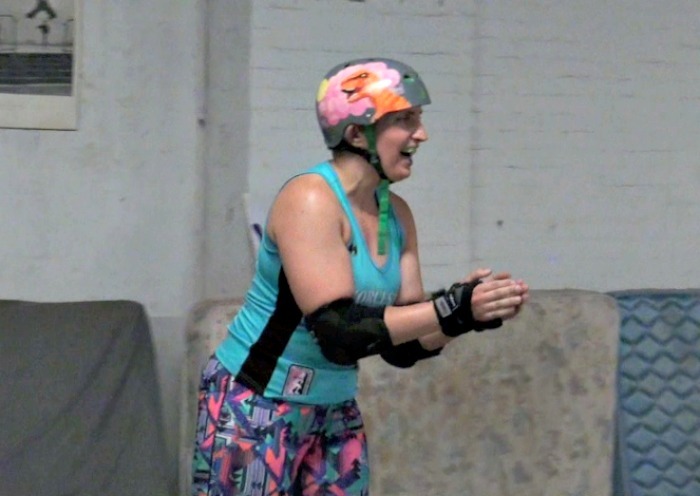 Jessica Potts, who goes by the roller-derby name of Sweat Dream, has been pleasantly surprised by the league’s welcoming attitude since joining in February. A 41-year old nurse with two kids, Potts has missed out on some practices, but still thinks she’s found exactly what she was looking for in WoRD. The social aspect of the team was also appealing to Nicole Heidenheim, who works as a teacher working with children on the autism spectrum at the Darnell School in Hudson. For two new team members who have recently moved to Worcester, the league has been especially helpful. Natalie Kennedy and her husband, a post-doctoral fellow at UMass Memorial Medical Center, moved to Central Massachusetts from Oklahoma City at the beginning of the year. Caring for her two daughters was taking up most of her days, so Kennedy, now known as DomiNat, decided to do something for herself at night. Amanda Stone is another recent transplant. The aptly named “Thrillinois” moved to Worcester from Springfield, Illinois, last November. 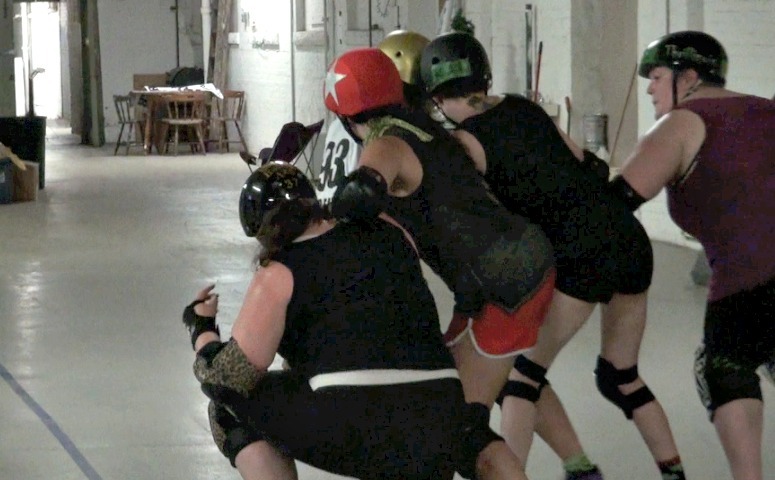 Stone had been hesitant to try roller derby in the past, but the prospects of conquering a fear and forming a new social group made WoRD appealing. While most women in the league are motivated by the social aspect, 22-year old Ariel Hitzhusen was definitely attracted to the physicality. Hitzhusen was just one of the many women who brought up the 2009 movie “Whip It,” starring Ellen Page, as a reason for looking into roller derby, but most also conceded that the film wasn’t very realistic after actually skating themselves. While WoRD may be in a period of transition, the characteristics that have made it a Worcester staple the last five years are still in place. It still provides a physical outlet and social environment for all different kinds of women, and now it’s time for a new generation of skaters to continue the WoRD tradition. WoRD will hold WooPS! Worcester Party Scrimmage Saturday, Aug. 13, at Horgan Arena in Auburn. For tickets and more information, click here. Joe Parello is a deputy editor and cofounder of SuiteSports.com and a frequent contributor to ESPNBoston.